Google goes for the block. 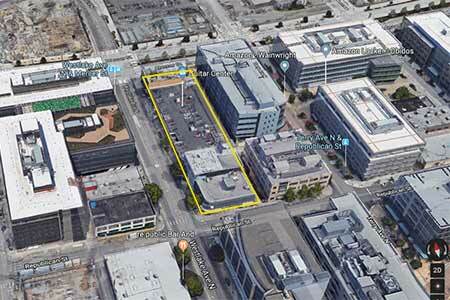 With construction of a four-building development right across the street well under way, Google has announced it will also take the block across the street on Mercer, the current site of Guitar Center and Uptown Espresso. The new 12-story, 322,000 square foot office tower with retail space on the ground floor will be constructed right next to Amazon’s Wainright building, which was one of the first new buildings built in what was once a faded industrial area in Seattle. The two companies will share an alleyway between them. Google, which already has 2,000 employees in the Seattle area, will greatly expand its presence in the city. The project on the north side of Mercer (at the top edge of the photo) will be completed next year and feature 151 apartments as well as shops. The 12-story tower on the south side of Mercer will be completed in 2021. Paul Allen’s Vulcan is managing the project. The new building will bring Google’s total square footage in South Lake Union to nearly one million square feet, making it one of the top five users of Class A office space in the city.